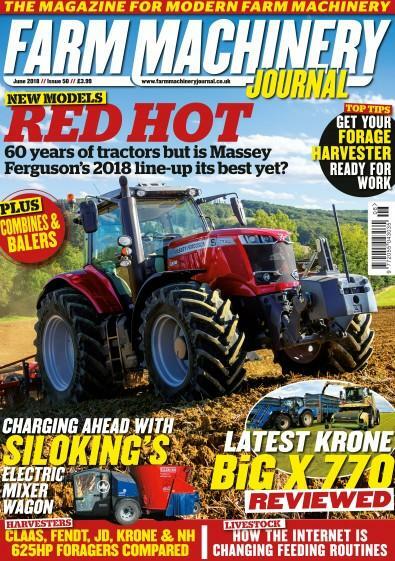 Farm Machinery Journal is the monthly magazine dedicated to modern agricultural equipment, from tractors to harvesters, from handlers to implements. If its found on the farm, you will find it on the pages of Farm Machinery Journal. With a focus on the most recent developments in farm machinery, you will find exclusive first drives, multi-machine tests and reports on all the latest equipment. There are running reports on how different machines are faring in their respective roles, as well as buyer's guides to help make the all important decision when it comes to upgrading the fleet. After all we are as committed to making sure you get the right equipment as you are. But don't just take our word for it - every test, report and guide is packed with expert user reviews and opinions from professional operators who spend their working lives at the wheels of the very latest agricultural machines. With the best writers and photographers Farm Machinery Journal offers a fresh approach to agricultural publishing and is the perfect accomplice for all your machinery needs. After all, if you are into modern farm equipment you will be definitely into Farm Machinery Journal. for modern agricultural equipment, from combine harvesters and tractors to materials handlers and implements. Every month Farm Machinery Journal offers operators and owners in-depth and independent coverage of the full spectrum of machinery in one convenient and easy-to-read package. If it's found on the farm, you'll find it covered in Farm Machinery Journal. Be the first person to tell us what you think about Farm Machinery Journal and you'll save £2.50 on your next purchase!